Present day celebrations commemorating the coming of the Irish Famine orphans to Australia occur each year at Hyde Park Barracks in Sydney on the last Sunday of August, and at Burgoyne Park in Williamstown usually on the third Sunday in November. (We’ll need to check this closer to time). Maybe someone would be kind enough to tell me if there are any such ‘gatherings’ elsewhere, Adelaide or Perth perhaps? Here are some more potted demographic histories of Port Phillip arrivals. Since the pertinent Victorian shipping lists do not provide parents’ names, it is sometimes hard to believe, Yes! I’ve found an Irish Famine orphan. These ones I’m pretty certain about. But do tell me if I’m wrong. You may wish to tell readers how you established your link to one of the orphans. Please feel free to share. 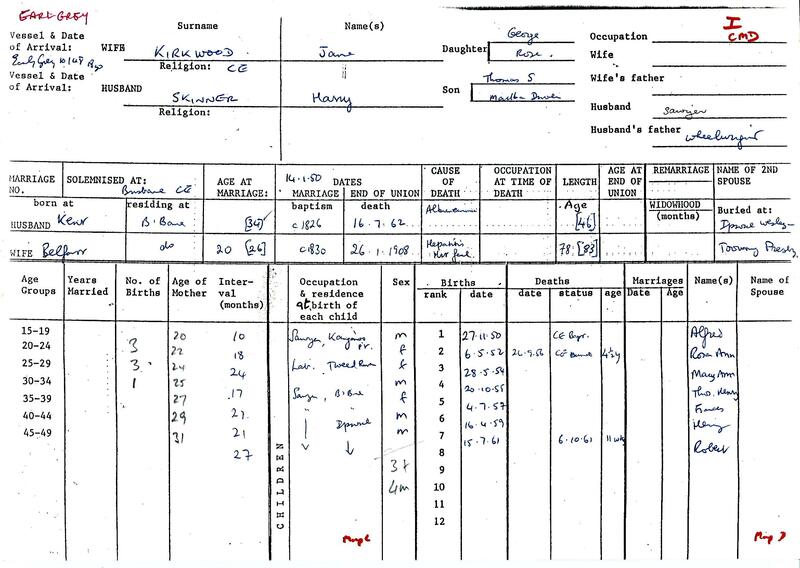 Cathy Tyrell, from Donegal, per Lady Kennaway, married a young man from Bedford, England in 1854 , five and a half years after she disembarked. She was only sixteen when she arrived. She and her husband lived in North Melbourne and together had seven children, three girls and four boys, one of whom died in infancy. Bridget Watson (or was it Watt?) per New Liverpool was also only sixteen when she arrived from Kilkenny. As with other orphans, she was sent by the Raven to Portland where she married her first husband, a Scot, James Gibson, in early 1851. Together they had twelve children in Portland. Her first four daughters died at birth. Bridget was only forty when James died. He left her an estate worth £209, containing a bush hut and land of “very inferior quality”. Bridget married her second husband John McPhee in 1878, not mentioned on the form below. She died in 1907 and is buried in Footscray. Mary Saltry per Lady Kennaway may have travelled with one of her sisters from Sligo, a younger sister called Sarah who died in Melbourne in 1850 only seventeen years of age. Mary married a market gardener of East Brighton, Joseph Thorne, originally from Middlesex, with whom she had seven children. She had twenty four years of widowhood. 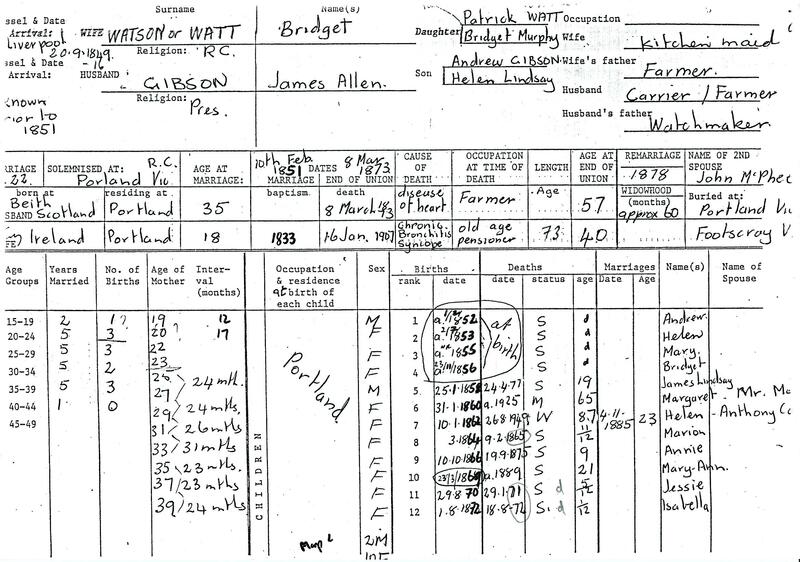 Margaret Ward per Pemberton is recorded on the shipping list as a fifteen year old from Tipperary but you will notice below that her descendant says she was from Mallow in Cork. Is there a controversy here? Do we have the correct Margaret Ward? 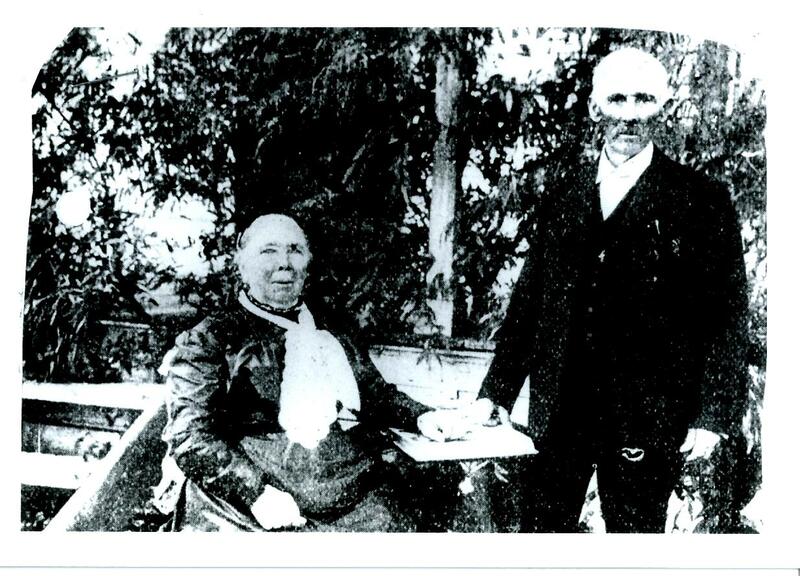 She married William Smedley a former convict from Derbyshire with whom she had sixteen children, all of them born in Kilmore, one of the places in Victoria where many Irish settled. Below is a photograph of Margaret and William at their diamond wedding anniversary in April 1910. Thanks to Louris Loughland who provided the photo. The last Port Phillip arrival for now, Catherine Perkison also travelled on board the Pemberton. She was to marry an Englishman, Joseph Nixon, at St Francis’s in Melbourne and went off to search for gold. Joseph a former mariner became a miner in Ballarat and lately a saw sharpener or grinder. He died in 1876 of chronic lead poisoning. Ellen Wade came on the last orphan ship to arrive in Sydney, the Tippoo Saib. She married an Englishman of a different religion from herself. She had seven boys and four girls. Her husband was a stockman in New England. She is buried in Ben Lomond. I was able to add some precise dates for the birth of their children. Ellen Tighe per Panama from Creagh, Kilkenny married six months after her arrival. 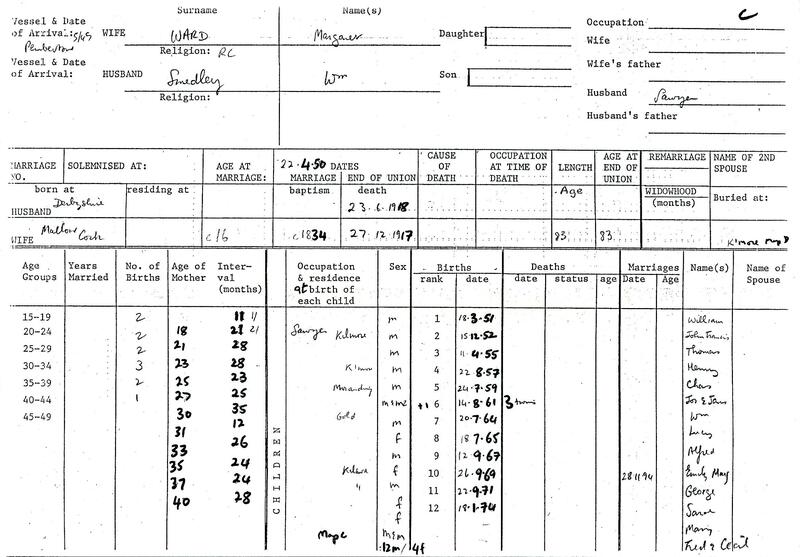 She married an Englishman by the name of Smith but such is the detail of New South Wales Board of Immigration shipping lists, and so good are the birth, death and marriage records, what became of her is not difficult to find. Ellen gave birth to ten children, five boys and five girls. Her husband Arthur worked as a labourer in St Leonard’s, Sydney before the family moved to the Shoalhaven district south of Sydney. 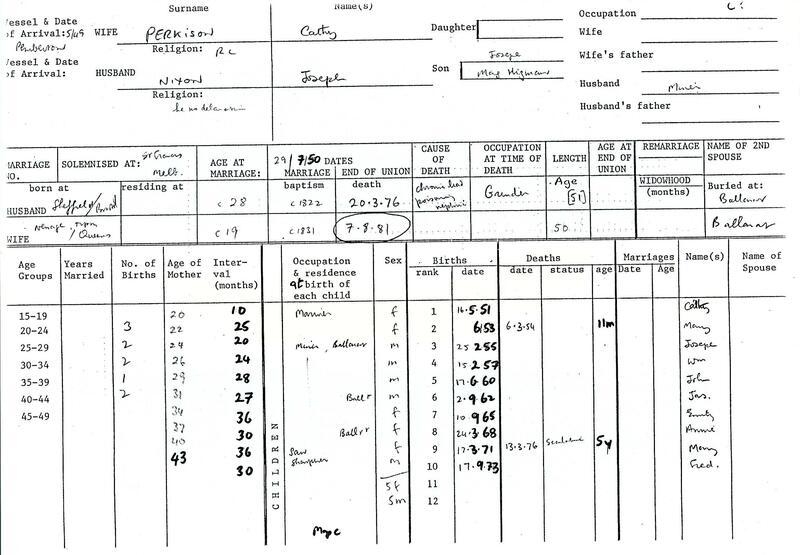 Arthur described himself as settler, then overseer and finally farmer when registering the birth of his children. Sixteen year-old Mary Shanahan per Lismoyne came from Adare in Limerick. Her mother was still alive and living in Rathkeale. When she arrived she went to John Byrne, her uncle at Lachlan river. In Bathurst, five months later, she married Patrick Neville, himself a Limerick man, older than Mary, and now a farmer of Fish River. Together they had twelve children, nine girls and three boys. Three died of diptheria before they reached the age of nine. Mary sponsored her mother and sister to come to Australia in 1856. (We should check that they did come). After her husband died, she remarried to Michael Cashman. She died in 1909 and is buried in Bathurst. There is a record of young Teresa Rourke, who arrived by the Digby, in South Dublin workhouse. When she was just ten years old, she came into the workhouse in September 1844 for eight months. Her dad had died and her mum had deserted her. She entered the workhouse again when she was twelve, in October 1847, wearing workhouse clothes when she arrived. She was to marry Henry Quinn in Bathurst in 1853. Together they had twelve children, nine girls and three boys. Henry was a farmer of Rockley, near Bathurst. Teresa predeceased him by eleven years, dying of pythisis , better known as tuberculosis. (See Patrick Neville’s ’cause of death’ above). Mary Ann Reilly per Lismoyne was also from Dublin. She had her indentures cancelled in 1850 in the Water Police Office court. See number 120 in the tables of cancelled indentures in blog post 21. http://wp.me/p4SlVj-vf In 1854 she married Thomas Caton in East Maitland. Thomas was a former convict, horse breaker and gold-digger. They lived in Dugworth, Sugarloaf, Boonoo Boonoo, Tenterfield and Timbarra. Thomas was to die in the Gladesville Hospital for the Insane in 1883. I wasn’t able to find a death record for Maryanne. 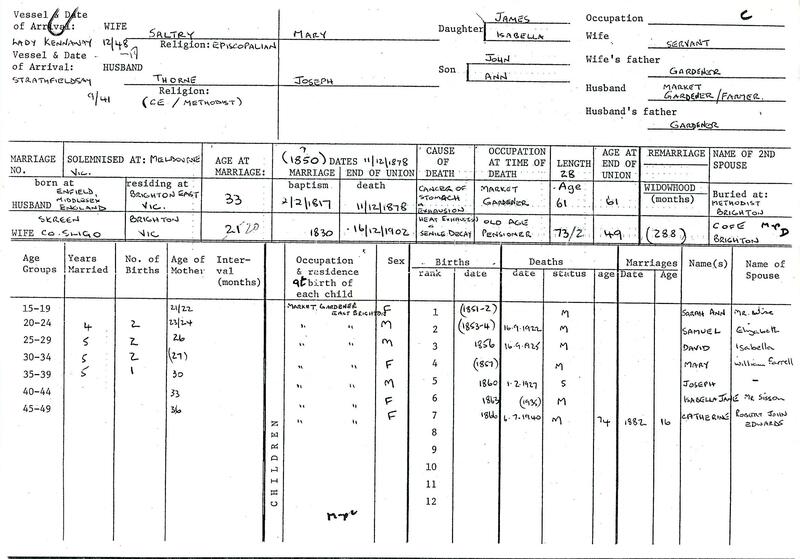 Here’s my family reconstitution form…do have a look at the riches Aileen has added in her story above. Obviously Dublin orphans did not have the same experience of the Famine as those from Ennistymon in Clare or Dingle in Kerry. But their destitution was no less real. Cathy Geary would have been aware of this from the stories told her by her shipmates from Galway and Clare and Kerry on board the Thomas Arbuthnot. Cathy was a factory girl living in Grange Gorman Lane in Dublin, close to the women’s prison, when she entered the North Dublin Workhouse, 1 February 1849. She left 30 October 1849 to join the others at Plymouth before embarking. Sent to Moreton Bay in 1850 she married Joseph Russell from Nottingham. Researchers at Queensland BDM records told me they found only four children for the couple. Both Cathy and Joseph are buried at Pine Mountain. Jane Kirkwood was literally one of the “Belfast Girls” sent to Moreton Bay. Her husband Harry Skinner from Kent had also came to Australia on board the Earl Grey when it was a vessel transporting convicts, in 1838. They had seven children, four boys and three girls, two of them dying young, when they lived at Kangaroo Point,Tweed River, Brisbane and Ipswich. Harry died in 1862, and Jane remained a widow for nigh on forty six years! She is buried in the Presbyterian section of Toowong cemetery. The digitised newspapers at Trove are a national treasure. When her husband died in 1896 he left an estate valued at under £621. Mary Creagh or Crae per Tippoo Saib from Listowel in County Kerry. (See Kay Caball’s lovely book The Kerry Girls which you can buy on Kindle). Mary married Thomas Taylor in Brisbane in May 1851. Her husband from Tyrone was a sawyer and they lived in Fortitude Valley and Moggill Creek. Their first three children died in infancy. Were they difficult births related to Mary’s Famine experience? They had five more children,two girls and three boys. Mary Carrigg per Thomas Arbuthnot came from Ennis in County Clare. She married James Winn from Cornwall in 1851 in an Anglican church in Brisbane. They had nine children together before Mary died at a relatively young age. She is buried in the Bible Christain section of Toowong cemetery. This entry was tagged Bridget Cannon, Bridget Quigley, Bridget Watson or Watt, Cathy Geary, Cathy Perkison, Cathy Tyrell, Digby, Ellen Tighe, Ellen Wade, family reconstitutions, Irish Famine orphans to Australia, Jane Kirkwood, Lady Kennaway, Lismoyne, Margaret Ward, Mary Saltry, Mary Shanahan, Maryanne Reilly, New Liverpool, Panama, Pemberton, Teresa Rourke, Thomas Arbuthnot, Tippoo Saib. Bookmark the permalink. Inspired by my ancestor Mary Flanagan’s story (William &.Mary), I have been greatly enjoying looking through your site here for over a year and am now embarking on adapting one of these stories for the ‘big screen’. I would love to ask you some questions regarding the life of Charles Strutt if possible? I’m in the UK and am finding it impossible to find copies of either your book, a Decent Set of Girls or Charles Strutt’s diaries and it’s the final piece of the puzzle that I am desperate to solve! It is possible to request copies of pages from the book online from Trove (if I remember correctly), but as I don’t know which pages or sections would be relevant to my research it’s not been possible to utilise that so far. I haven’t been able to find any background info on his life in my googling efforts. Any info, links or contacts you could give me would be hugely appreciated. Thanks so much for your replies Trevor and those links. I am really looking forward to finding out more via the Facebook page etc. Thanks again, will send you a copy of my writing once it’s finished! thanks heaps Julie. Kirra should be able to get a copy from the State library of Victoria. Thanks so much Julie, I will contact the library and hope I can get hold of a copy of Strutt’s Diary too. It’s funny I couldn’t see an option to do that through the website. I tried to get a copy of a Decent Set of Girls via the library but was told that I could only have copies of sections rather than the whole thing as it’s still in copyright. I’d love to see the diary of the free settler too, would you mind if we stay in touch during this project? Which orphan are you descended from? You may be able to see my email address via this comment but let me know if not and I’ll send it to you. Thanks again! I can’t see your email address Kirra. I’m happy to share free settler’s diary. In it there is little on the girls but there are details of the journey. My ancestor is Bridget Ryan from Listowel Workhouse. Thanks Julie. I can see kirra’s email. It is kirrazen(at) yahoo.com A user info button appears at top right of her comment. Not sure if everyone can see it. I’ll remove the address if it’s not the right thing to do. Many thanks for your help. Will look later Gail. Sorry, nothing more than what is in Barefoot 2 and on the website. Hello Trevor: My research also indicated that Mary and Sarah Saltry were from Skreen, County Sligo, lying in the PLU of Dromore West. Your list of Mary’s children confirms that they were indeed sisters, for Mary named her first child, Sarah Ann, after Sarah who had died a year or so earlier. Hello Grant, both names and addresses appeared in volume one of my Barefoot. Only Muriel’s alongside Teresa/Dorinda Saltrys in volume two which came out end of 2001. What does the website say? That’s a good while ago.